You don’t need to tell me, I know you loved it! And your next holiday will definitely be Bohol Island in the Philippines. I don’t blame you, after two weeks there I’m already dreaming to go back. And you know why? Because while many tourists are flocking to Boracay (we visited there too and enjoyed a lot), not that many people go to explore this beautiful island. So there you can feel the truly Filipino atmosphere! Bohol is the tenth biggest island in the Philippines, is located in the middle of the archipelago (the country has more than 7.000 islands). It has a bit more than 4k square kilometers and is surrounded by others 75 small islands. 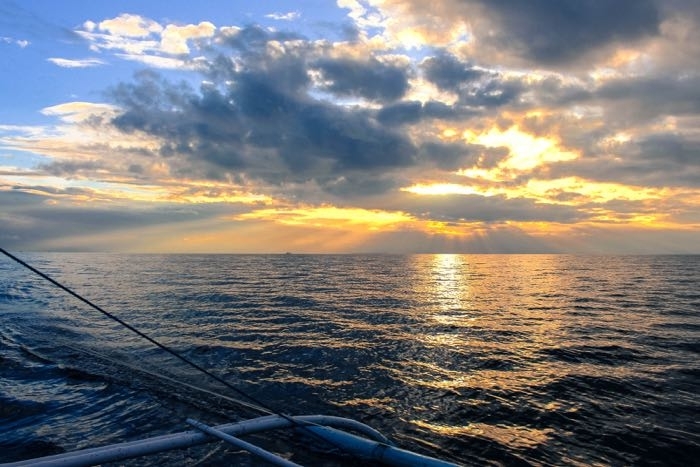 Most people think that the Philippines is just about paradisiac beaches, actually is much, much more. Bohol is the perfect example, there you can find stunning white sand beaches, lush green forests, symmetric hills and an incredible underwater life. 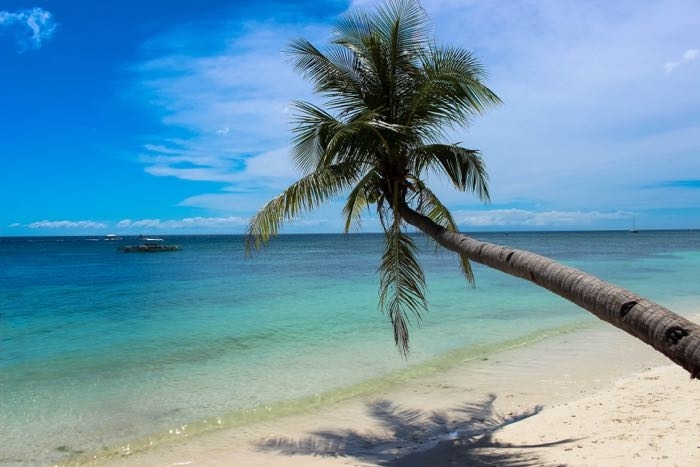 Bottom line: Bohol Island in the Philippines will enchant you! Are you prepared to follow us around Bohol? I promise I will try not to write a huge post as I did about Boracay, but its hard to keep it small and simple, we love the Philippines! 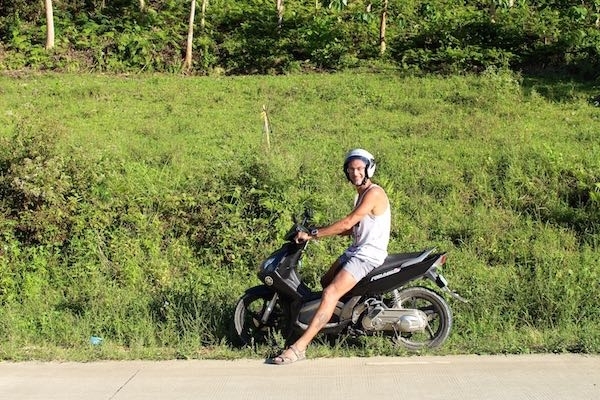 » Our first recommendation: rent a motorbike in Bohol and explore the island on your pace. There is no better way to see the amazing nature, to meet locals and have fun. Don´t be afraid, Filipino traffic is fine, people drive very slowly and there are signs all over the island. If you get lost, no worries, everybody speaks English. And be lost is the perfect opportunity to make friends and feel how warm and helpful Bohol people are. We rented our scooter with Island Rentals, and we receive great tips about safety and on what we need to pay attention when renting a motorbike. We learned so much that I decided to write a small guide: How to Rent Motorbike in Bohol & Everywhere in the World. Now that you know the best way to get around Bohol Island in the Philippines, time to show why this wonderland enchanted us! White sand, crystal clear water, giant starfishes and a breathtaking sunset. Do you need any more excuses to stay there? Balicasag was one of the best places to snorkel we have gone! 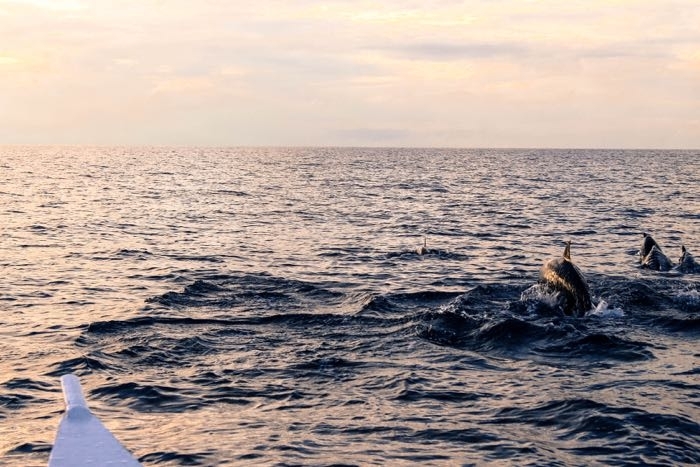 Before we reached our destination, the sunrise and the dolphins welcome you to the sea, what a spectacle! 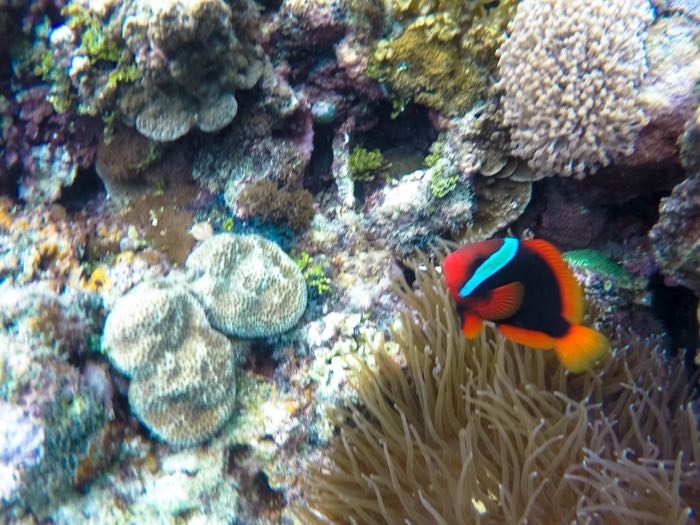 On the island we swam with colored big fishes, preserved corals and dived in a deep blue sea. Balicasag has an underwater cliff, what makes the island one of the perfect spots for diving in Bohol Island and in the Philippines. The mainland of Bohol Island was a great surprise for us! With our scooter we had the opportunity to go to small villages, where we couldn’t find any tourists. There is nothing more rewarding them visit a place that makes you feel comfortable, happy and part of it. That´s how I felt in Loay, our second address in Bohol Island. I´m sure the people from Bohol are the biggest reason why I want to come back there. One afternoon we went for jogging after my 5Km I stopped on the beach to do some stretching while Rob was finishing his run. In less than 2 minutes I was surrounded by 6 or 7 kids all them doing the same exercises as me. We stayed there playing for almost half an hour, counting in English and Boholano (they tried to teach me their dialect), until the beautiful sunset put an end on our fun. I don’t have pictures of the awesome moment with the kids. I never expected that could happen. However, that day will stay forever in my memories and in my heart. Because doesn´t matter where you came from, or which language you speak, friendship and smiles are universal and the Filipino kids know this! After making friends was time to explore a bit more of Bohol Island in the Philippines, and you will be amazed by such beautiful nature we found there. Loboc river berth is in the middle of the island, but it´s near the Loboc Village that all the action starts. Many people go for the restaurant boat to see the river, but we found it too boring for us! That´s why we decided to meet Frederic from the SUP Tour Philippines. 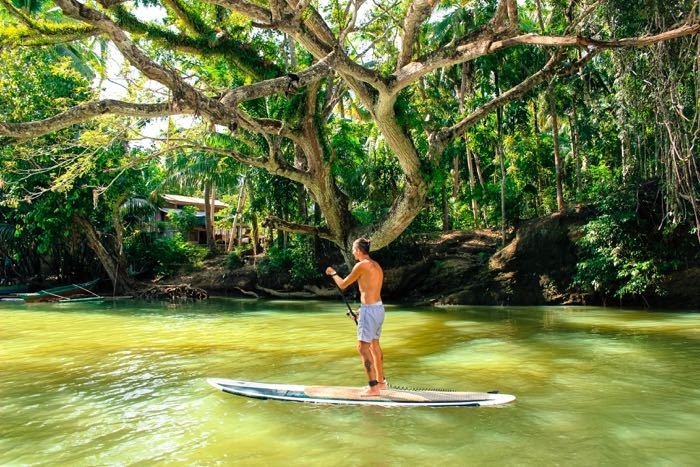 If you read our post about Boracay you already know that stand up paddle is my new affair, so practice SUP on the Loboc river sounded like a perfect plan to me! Nature and the river are fantastic. The water is so clean and all the green around is a real tropical paradise. We did just the SUP tour on Loboc river, but the company also offer mountain bike tours and yoga activities. Worth to check the schedule and join the groups. Can you imagine 1.700 symmetric hills all them side by side with same shape and size? Incredible isn’t it? And it´s true! 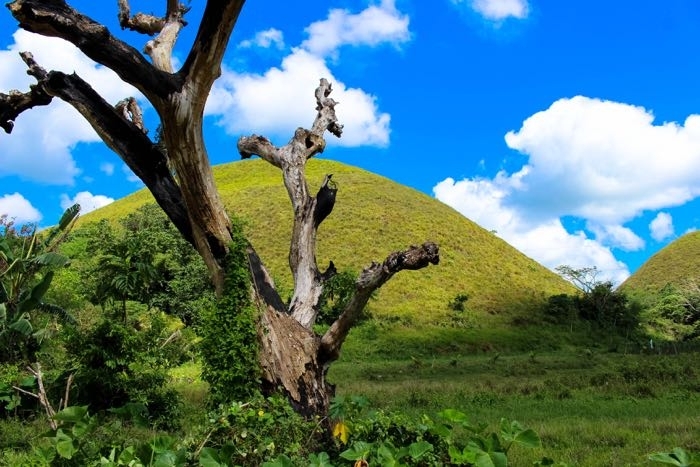 In the heart of Bohol Island you can find the Chocolate Hills. They are spread in an area of 50 square km and during the dry season the green grass of the hills changes to brown color, that´s why they are called Chocolate Hills. No doubt this is the most delicious attraction in Bohol! The Chocolate Hills are definitely a place you have to go by motorbike. There are daily bus tours going to the viewpoint, but you will just get a small taste of it. The best part is to explore the area around the Chocolate Hills, drive between them in tiny muddy streets and be enchanted by the perfection of nature. The Bilar Man-Made Forest is for me one of the most powerful attractions on Bohol Island in the Philippines. The beautiful forest is the proof that men and nature can work together. While driving in the forest we stop several times just to contemplate the beauty. 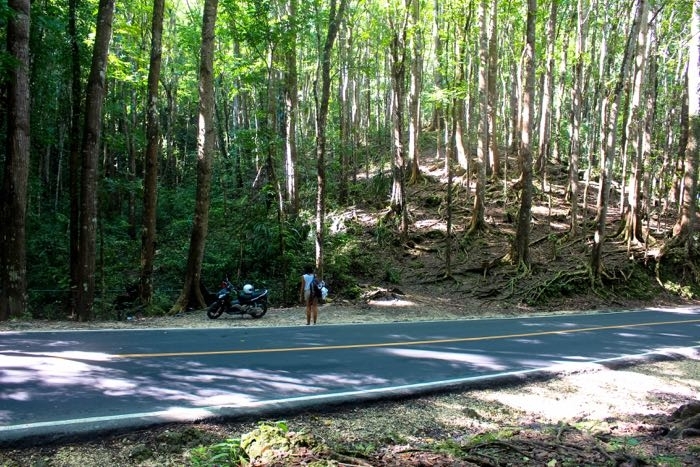 The dense forest stretches up to 2 kilometers between the Loboc and Bilar towns. In 1947 the government started a project of reforestation. Together with the community, red and white mahogany trees were planted in 19,410 hectares of land, putting an end to the deforestation process that was happening in the Loboc watershed. Remember: We have to be responsible tourists! Tagbilaran or simply Tag is the capital of Bohol Island in the Philippines. The port and the airport are located there, also the shopping centers, big restaurants chains and street food markets. From Tag you can reach all the small villages in Bohol and Panglao island. Walking around Tag you can visit many churches and witness how strong the Catholic Religion is in the Philippines. During the year there are many festivities and parades happening there. We were super lucky while exploring the island we found a nice party going on. Kids were all dressed up in costumes and big performances were happening beside the church. Again, we were the only foreigners there, but that wasn´t a problem. In 2 minutes we were already talking with people, dancing and taking pictures together. Get your motorbike and drive from Tag to Antequera. The road is really scenic and only 20 kilometers from the town you will find a cute village in the mountains and a beautiful waterfall. Mag-Aso Falls was an 8 meters twin waterfall with crystal clear water, one of the top attractions in Bohol. After the 7.2 magnitude earthquake in 2013 and subsequent typhoons, the waterfall has a changed a lot but is still beautiful. The natural disasters affect Bohol Island in the Philippines a lot. Not only the waterfalls were damaged, but other attractions like bridges, churches and many houses were destroyed. Driving around the island you can see the scars on nature and on the urban areas. Where to Stay in Bohol Island? As I said, Bohol has so many things to do and see that we decided to split our stay in two different areas of the island. That way we could enjoy different vibes and reach all the attractions in a small driving distance. If you want to explore the whole Bohol Island [what we strong recommend] just follow our tips to book the best hotel for you. 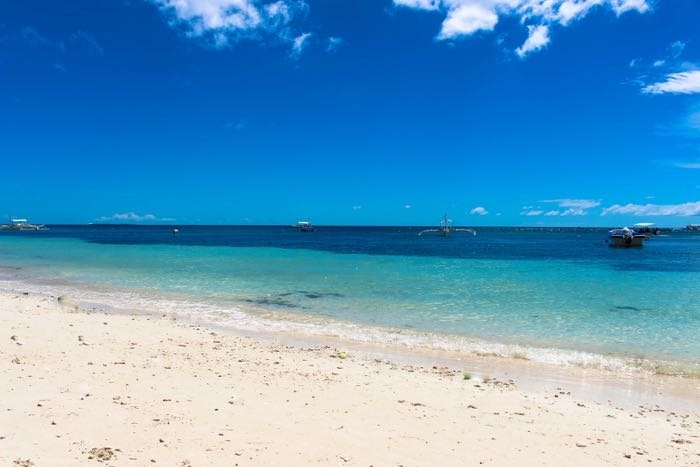 To enjoy the white sand beach book your accommodation in Panglao Island. 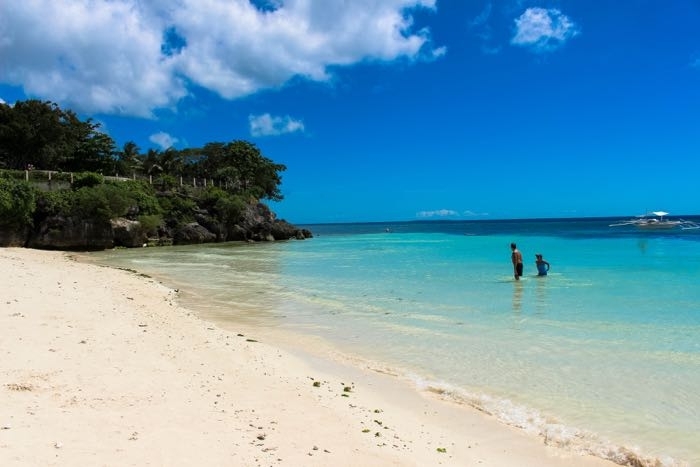 The busiest beach is Alona, where you can find luxury resorts to middle range hotel. Just be aware that most of the cheapest hotels in Bohol offer only fan and cold shower. Loboc River is the perfect spot to relax and be in contact with nature. From there you can easily reach the Chocolate Hills, Man-Made Forest and Tarsier Foundation. My recommendation is to book your accommodation at the beautiful Fox & Firefly Cottages. 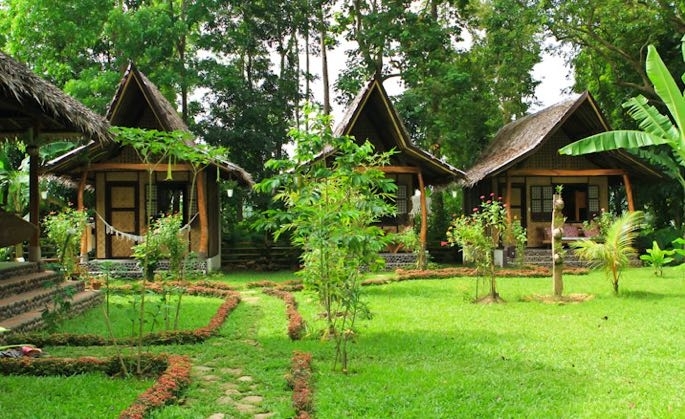 The place is carefully designed, you can stay in a traditional Filipino hut, in the middle of the green with all the comfort and amenities you need. The best part: Loboc River is your neighbour! These three areas are great spots to find a hotel in Bohol Island. They have different types of accommodation from hostels to luxury resorts. Tagbilaran is the center of Bohol, we stayed there just one night, the day before our flight. As we were leaving the island early in the morning we thought would be smart stay near to the airport and avoid traffic jam. Loay was the village we stayed during the time we explored the mainland of Bohol. The tiny fishermen beaches are super interesting and you can have the real connection with local people. 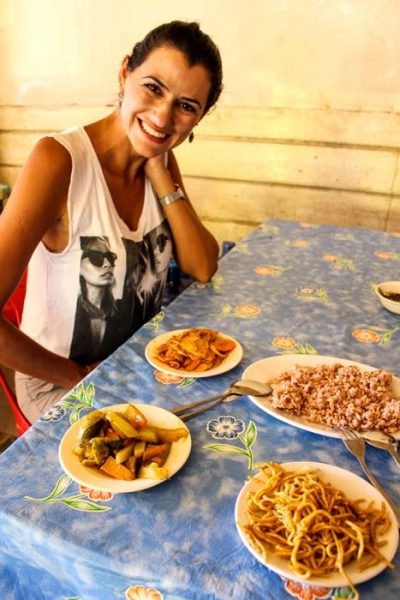 Loay is one of the best places to eat fresh fish and from there you can reach all the other parts of the island. Another great touristic spot is Anda Beach. A little bit far from Tagbilaran, this beach is famous among the divers. Hotels and resorts are laying on the beach waiting for travelers and sea lovers. How to get to Bohol Island in The Philippines? Or you can get to Bohol Island by boat, ferries depart every day from Cebu Port. There some other lines operating from small islands around Bohol, but they are not often. From Cebu to Bohol we choose the SuperCat ferry and they offered a reasonable price and good service. You can check the timetables here. If you have some extra days in Cebu you must visit Oslob and get to close to the giant and majestic whale sharks. Check here how to get to Oslob and add this adventure to your travel itinerary. It´s impossible to please everybody, and also we can´t generalize that a country cuisine is bad or good. However, as a food lover and also an enthusiast about the Philippines, I think I have the right to express my opinion and say that my stomach was really happy while we were traveling through Bohol Island in the Philippines. True: They have lots of fried chicken, fried pork, fried sausages, and most of the drinks comes really sweet. False: The local dishes aren’t delicious. First you have to leave your prejudice outside of the restaurant and then you will be amazed by different and unique flavours. In Bohol we tried a delicious savory soup made of coconut milk, jackfruit and ginger. Sounds like a strange combination, but it was yummy!! Rob elected it as one of his favorite asian dishes. 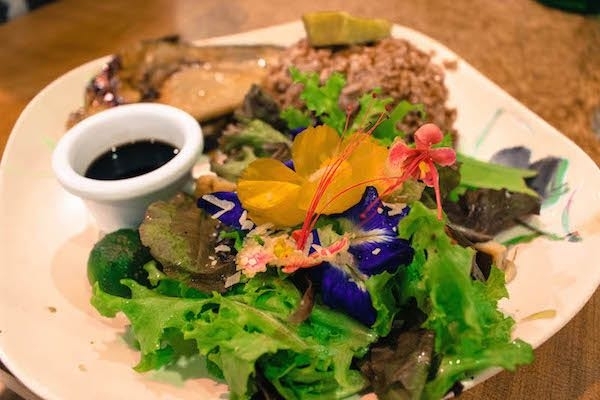 I loved the Malunggay and young coconut meat soup, the ginger ice-cream, the fresh salad with flowers… OMG!! Better stop now, I’m getting hungry! My point is: be open and try new things. Most of the time we ate in small eateries, sharing the table with students and workers, learning about local veggies and tasting delicious recipes. Different from Boracay (busy and more touristic developed), Bohol Island is the perfect place to forget the big restaurants, to avoid fast food and just immerse yourself in the local culture. I guess I wrote too much again… But if you kept reading till this point it means that Bohol Island in the Philippines enchanted you too! Welcome to the club! Our trip through the Philippines ended in Bohol and I have to say that I regret not having more time to explore this magnificent country. The list of city and island we want to visit in the Philippines keep growing, and every time I talk to a Filipino they point me a new unmissable destination. Now it´s time for you to organize your trip to Bohol Island in the Philippines, and we’ll be here dreaming and planning our come back. Because the Philippines is still on the top of your bucket list! Did you know Bohol Island in the Philippines? Have you thought about traveling to there? Your comment and thought are more than welcome! Visit Albay, Bicol next when you come back. You will not regret it! 🙂 Great post! I also read your Boracay blog. You two are amazing! Just Googled Albay, looks stunning!!!! It`s in our list now! I’m sold! 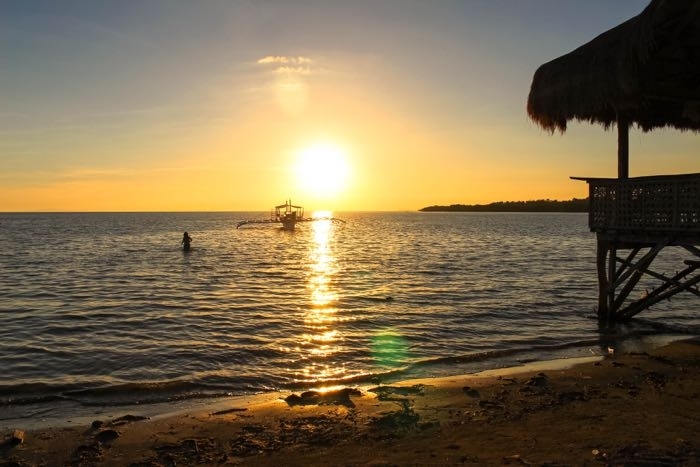 Bohol Island looks like it has it all – good food, people, beach and mountains! And dont forget the crystal clear sea! First off, that first sunset photo is so beautiful! Secondly, when can I go?! Haha. I’ve never thought much about visiting the Philippines but now I’m considering it. It just looks so, so beautiful! You wont regret, nature & people there are lovely! Wow, this looks gorgeous! Great photos and cool video! Did you use a GoPro? Yes, Go Pro Hero 4 and edited with imovie. They were celebrating St Nino, Filipinos are really religious. Actually, they asked to take pictures with us, so we started the conversation. I’m a SUPer so you had me at your first picture but then I kept going. The beaches, the Chocolate Hills and the people- it just kept getting better! 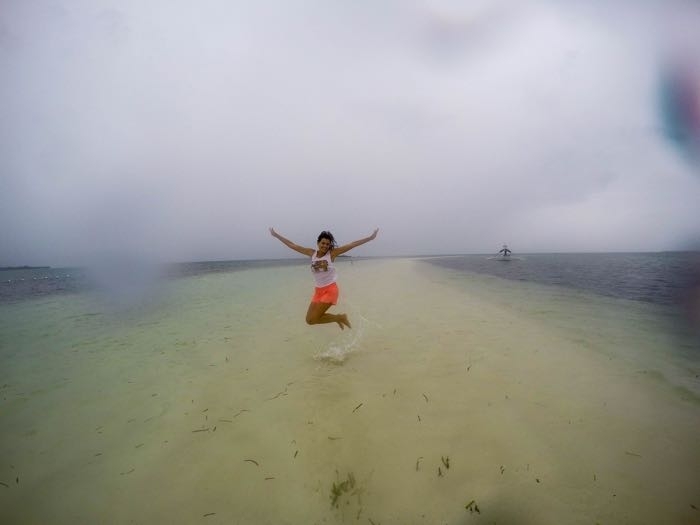 Thank you so much for such a great post on Bohol. 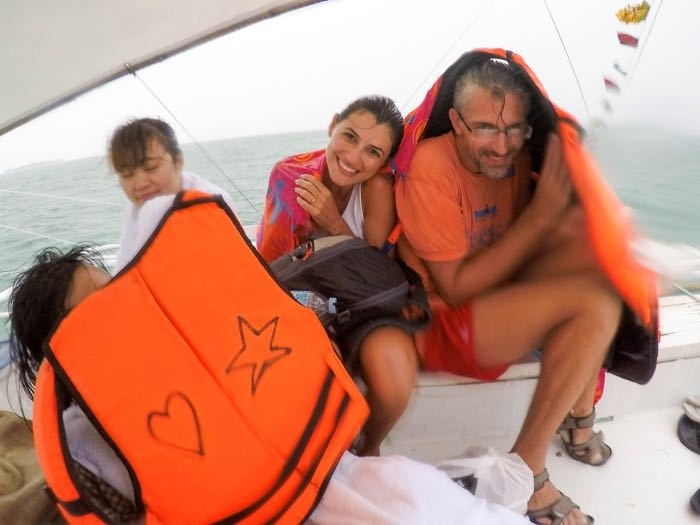 My husband, Daughter and I are starting our full time, round the world, life starting this summer and because we’re Filipino Americans who haven’t spent much time in the Philippines, we are going to stay in the country for an extended time. Bohol looks like a perfect island to stay after Boracay. I can’t wait to follow your footsteps! For sure you will love it! We want to return for a longer period later this year. There are so many islands to be explored! A very well thought through piece. Make sure you go! Seriously, the nature in the Philippines is beyond stunning! And people there are absolutley lovely. Wow, that beach is really breathtaking…I never expected it to be one from the Philippines. I love it when someone writes about their experiences from somewhere and you can really read their excitement and their fun experiences thru their words. That makes that place so inviting. And I can see from the pictures that you had such a wonderful time. I think I should plan my trip there soon. There are no word to describe how beautiful is Philippines. Our advice is: Go!!! You wont regret. As we mention before, we both thought about you when we arrived in Chocolate Hills! Too many people turn their noses up at the delicious food in Asia! I can not complain about asian food at all! Wow! That place looks gorgeous! Yet another addition to my bucket list! New up n coming island everybody’s raving about is the Siargao island on the east in the Philippines. Also Malapascua in North of Cebu. There’s Siquijor close to Bohol. And of course El Nido n Coron both in Palawan. Backpacking crowd also raving about the ancient rice terraces in Batad and Pinatubo crater lake climb on the north. I’ve only been to Bohol and Manila. Can’t wait to explore for more! I agree about the lovely people! Siargao island was in our plans, but we enjoyed so much Bohol that we decided to stay there longer. But deffinetly we are going back to Philippines. Siargao, Palawan and El Nido were already in our future plans now you give us more amazing destinations to see… I think we´ll need at least 3 months to see and enjoy this beautiful country! Looks like an incredible experience! The video got me pumped! 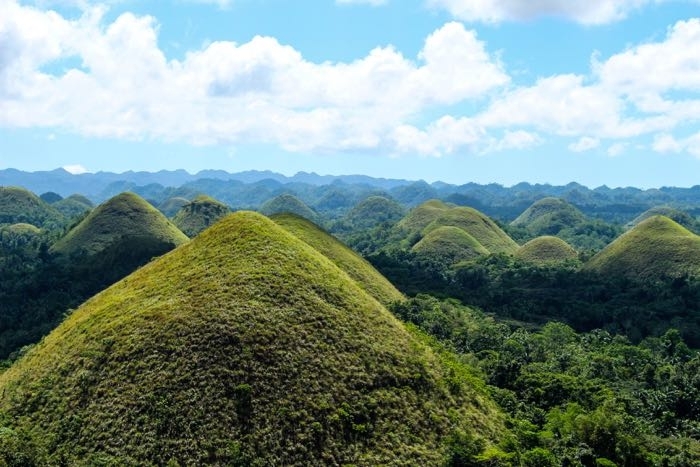 I think I’d like to see the Chocolate Hills for something different. I´m glad you liked the video, we just started doing videos, so it´s good to have some feedback! The hills are impressive to look at and it´s a good alternative if you get tired of beautiful beaches! The pictures look amazing! I have heard such great things about Bohol. Sadly I did not get there! I loved El Nido and Boracay! I did not love the food but I did not think it was as awful as people were making out! Ohh Sally, you went to El Nido (I’m envy now). We had an amazing time in Bohol and definitely we need to come back to visit Palawan and other islands.. Thanks for stopping by! 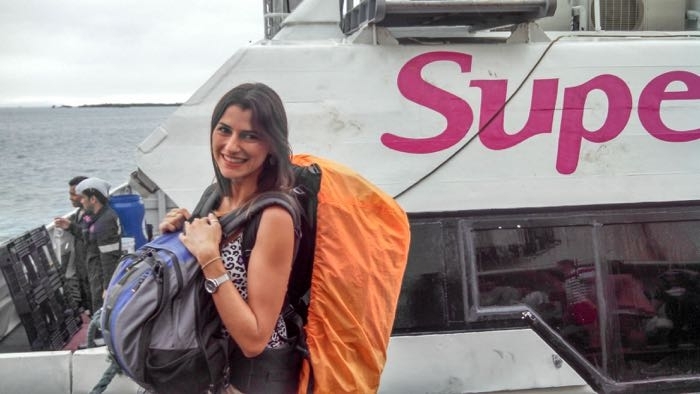 If travel is your life dream and goal, go for it!!! Never give up! Travel is one of the most rewarding things we can do in life. Has been almost an year that we gave up of our “normal” life to travel and until now no regrets! Thanks for liking our blog and follow us! If you need and tips about travels and how to save money for travel check out out other posts, and if you need any specific information just write to us! Try to visit Cagayan de Oro, Philippines too! With side trip in Camiguin Island and Bukidnon you will love it! I agree with Chris. You also need to go visit Camiguin Island. 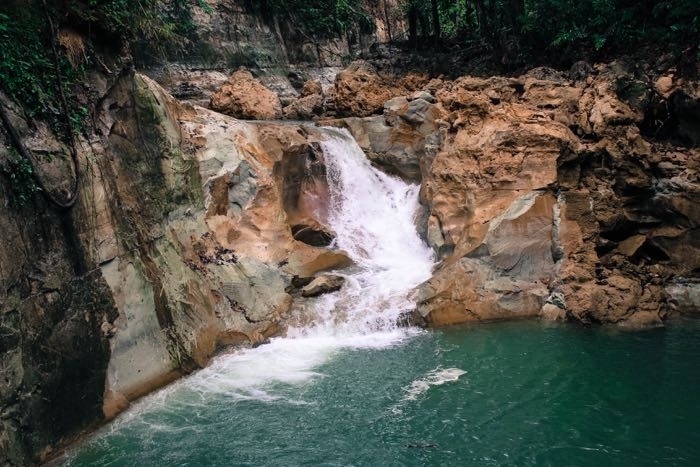 It has lots of stuff like waterfalls, crystal clear beaches, hot springs, soda waters, cold spring, and cool forests! Somewhere in the south, the Island Garden City of Samal is a must-see paradise, too! Next time we´ll have to plan at least three months of travels, do you think it will be enough? Super happy that you liked our Blog. We write with love and passion! And thanks for the travel tips too! Great post. I really enjoyed looking at the photos of Bohol. I wondered if you went around cebu as well? But that´s why we need to go back, some many places to explore! Gald that you are enjoying your time in Bohol! I put it on the list for when I get to the Philippines coming september. It sounds like a must see. Bohol is a unique place, I´m sure you will love it! Especially the people, they are amazing. 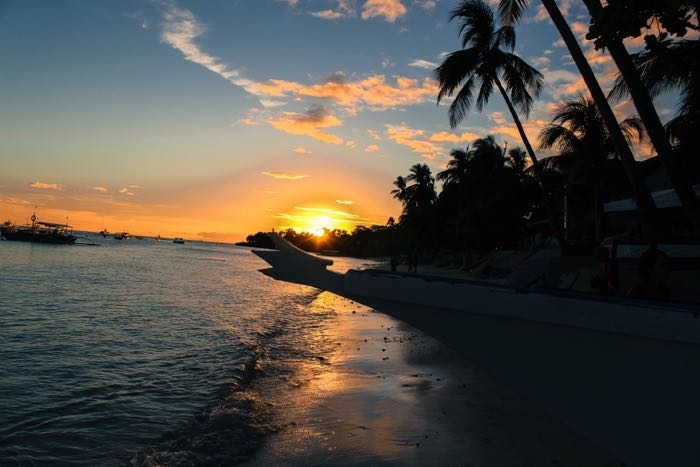 Don´t stay too long in Panglao, head to the tiny villages and you will be amazed! Hi, Oh! 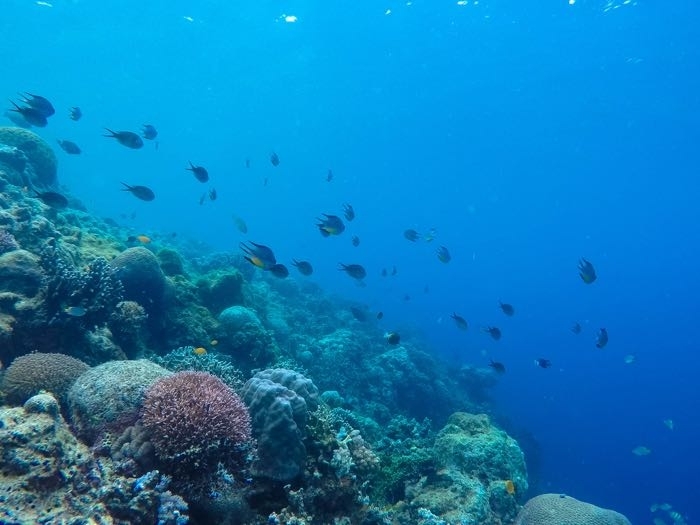 You haven’t been to Verde island Passage, they say (They, means the Scientists who’re exploring the area since 2011 for new species) its the center of the center of marine bio-diversity in the world. It is between the Island of Puerto Galera and Batangas (Luzon Island). Siquijor, Urban legend is that it is where the witches congregate. Filipinos avoided it but in recent years, more are braving the odds. Surigao (Caraga Region), ancestral gold were discovered in these parts. Kingdom of Butuan is located here (Pre-Spanish era). some of the treasures that was saved are being displayed in Ayala Museum (Greenbelt) in Manila. Next Davao City (Davao Region) is home to the Philippine Eagle and you will witness nature’s abundance here. I know this is in the Island of Mindanao. Off-limits but oh! There’s more! Thanks for such amazing tips!! Philippines is a stunning country with many natural wonders. Wish we could have time [and money] to visit them all!! But I will keep in mind this list you gave us! Yeah. I myself have not been to so many places here. Though, I know most of Mindanao, and some of Bohol where all my forefathers are from. My uncles and grandparents would often ask when I would go home to Bohol, but my dad would say, I am a davaoeno (person from Davao) not a Boholano. A Boholano may have traveled the whole World but he will always come home to Bohol. Been there twice but I never visited The chocolate Hills though i know it existed since I was a child. My aunt would tell me as a child that it’s a land full of chocolates. That you can only dip your fingers here and there and walah! Yummy!. I grew up thinking it’s my oh la la place. Silly me. This is the Island where the humblest, happiest and funniest of Filipinos are from. They like to tell jokes and stories. Now, I’m in Manila. I know it’s an chaotic here but, it has something that i crave, aside from my work of course, arts and culture, museums, intramuros, cuisine. Filipino contemporary arts are good. You,d be surprised. Loved the description of the Chocolate Hills, is not silly at all. It´s delicious, and makes all sense your aunt tell this story. And definitely the Boholano are humble and happy people, met a few of them and all them were great character. Enjoy Manila, didn’t have time to explore the capital yet, but know that it´s crazy with bad and good things! Stunning pictures! Thanks for sharing this – I’m going to Bohol next month, and this will prove very useful. Was definitely looking forward to the chocolate hills and the tarsiers, but you got me stoked about plenty of other stuff as well now. And great tips on the food as well, which is something I was a little concerned about…Thanks again! You are welcome!!! The chocolate hills and tarsiers are beautiful, but don´t forget to explore the whole island and enjoy the Loboc river… We loved Bohol so much that we considering go back on our next trip to Philippines!! I’ll be visiting to dive in May 2016 (Tubatha Reef)so it was exciting to hear about the Bohol island drop off. Bookmarking this for later! Wow you’re making me a lot prouder of my home town.. thanks for this blog guys. Everything you say here really speaks of Bohol. 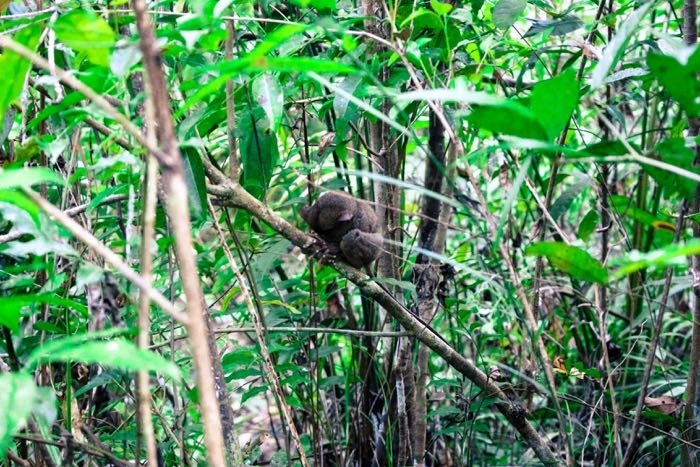 I was once a volunteer at the tarsier sanctuary. Much love! You made us so happy with your comment. Thanks! We really enjoyed Bohol and want to show the world how beautiful your hometown is! Tks! Glad you liked the post. Bohol is a must-visit for any traveler. The beaches are beautiful! The island has a lot to offer for every traveler out there. We want to return ASAP! I agree with all the people commented on the pictures you posted . That Bohol is really beautiful island . Planning to go in September! How is the weather? Usually temperature ranges between 23-32 Celsius and it rains about 9 days in the whole month.